My Aeolian love affair begins! 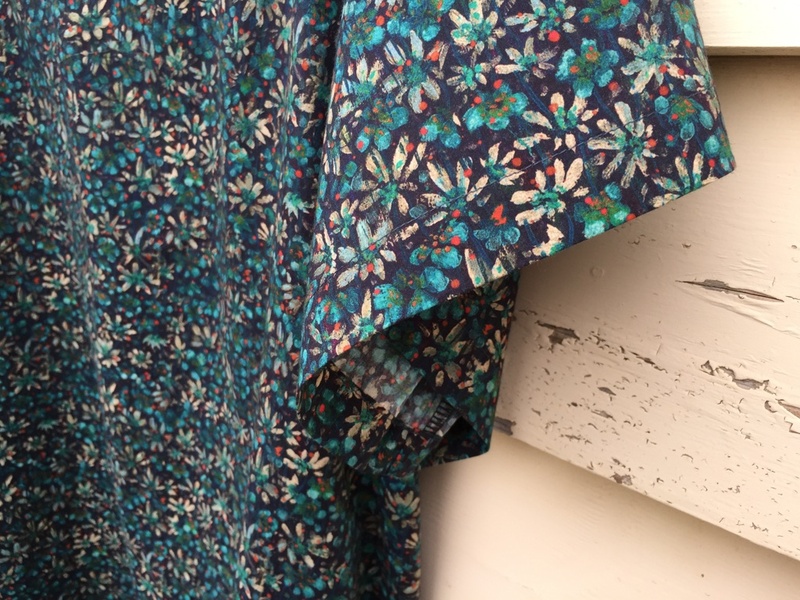 Although it’s taken me oh, at least six months to make this pattern, I am completely in love with it, and am already lining up fabrics for more. I first came across Pattern Fantastique when Nita Jane emailed me at Stitch 56, asking if I’d like to carry her patterns in my shop, saying she was introduced to me by Anna from bloglessanna, who has blogged extensively about her Aeolian makes, clear evidence of a mild obsession with them. Well gosh, that’s no exaggeration! Last week I did a search on Anna’s blog for “Aeolian”. Of course I saw her at Melbourne Frocktails in her lovely Jelly Bean Aeolian, but when I looked at her website, I couldn’t believe it, she’s made heaps of them! It was her Liberty versions though that swayed me. I don’t know if you know this about me, but I’ve quite a stash of Liberty in my cupboard, and this is one of my favourites. It’s Eleanora E, from the AW14 collection. I had a 60th birthday to go to last Saturday night, and since I wanted a new dress, I decided to go for the Aeolian. Finally. Now, I hadn’t remembered, but the Aeolian is designed for knits. I’m quite a newcomer to the world of sewing with knits, so when I opened up the pattern instructions and started reading. When I got to the bit about faux ‘flatlock’ with an overlocker, frankly, I got cold feet. I really didn’t have the time to work through and learn this properly. 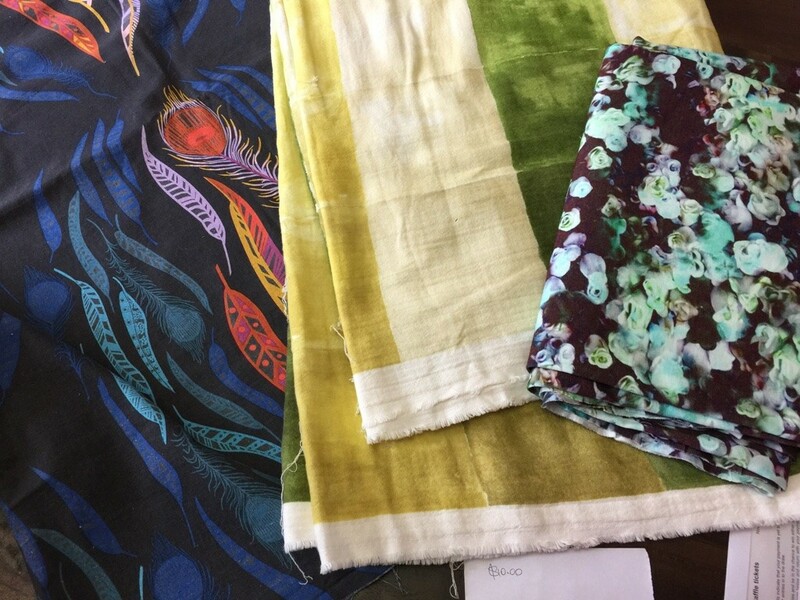 Thankfully, Anna has written some great tips about how she modified the pattern for wovens, so I continued. Here’s what I did. The Aeolian has only 4 pattern pieces – a front, a back, a sleeve, and a neck binding that I didn’t use. I read through the pattern instructions just to check that it didn’t have any steps I needed to pay attention to, and then put them away. 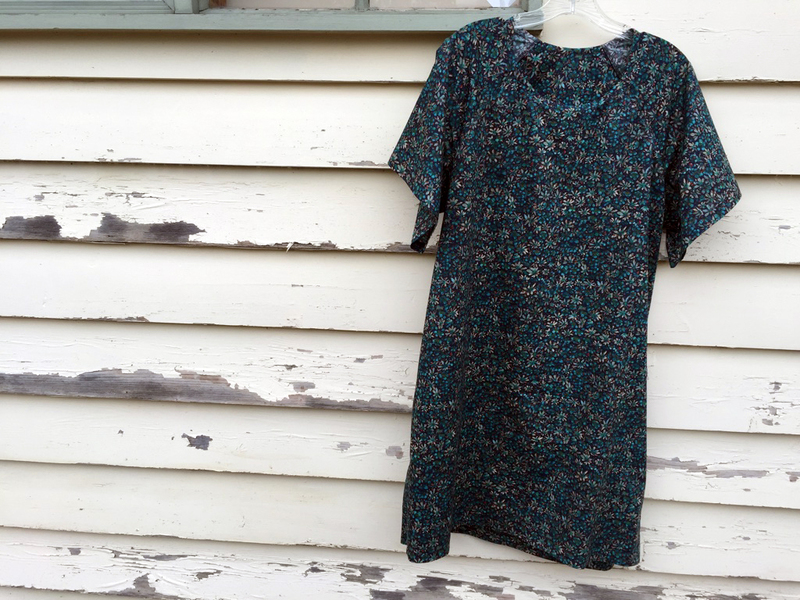 I knew how to construct a simple dress like this, and the knit instructions seemed to not apply so well to my lovely woven, so I just followed my instincts. 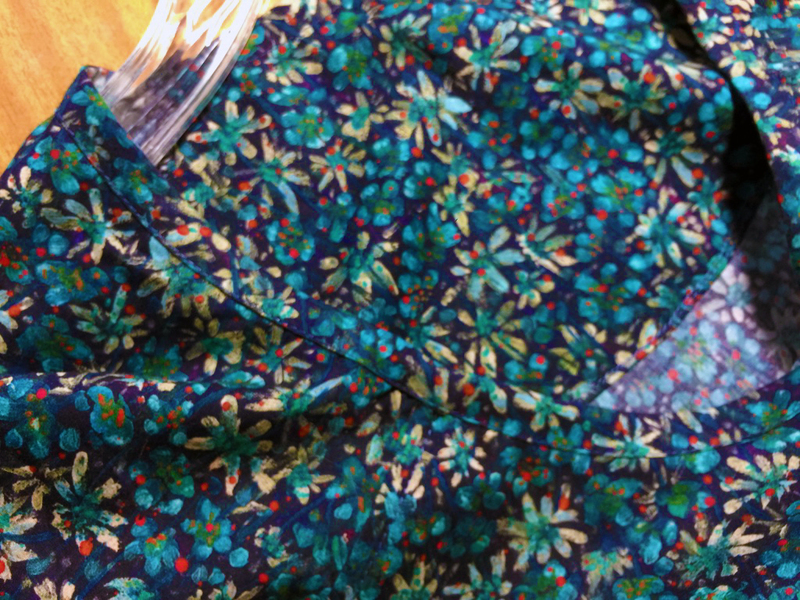 Then, I used ½ inch seams, and finished all 4 raglan seams with my overlocker. I pressed the seams to the back, and topstitched at ¼ inch from the seam. From there, things went pretty quickly. I sewed the side seams, overlocked them, and pressed them towards the back. All of this was done by around 10am on the Saturday morning of the party. I figured I’d get home at around 4:15 and would have heaps of time to finish my dress in time to wear it that night. Well, cursing Murphy, I arrived home at 5pm, but I was sure that if I worked quickly, I could get it done. For my first go with this pattern, I decided to stick to the recommended 3cm sleeve hem and 8cm bottom hem. I pressed an 1/8 inch under on the sleeves, measured 3cm and topstitched. Same with the hem. I turned under a ½ inch, then measured and pressed up an 8cm hem on the bottom of the dress, and pinned it to see how it looked. Moshe said no, he didn’t like it, so I decided to try making it shorter, and turned the hem allowance up one more time to double it before marching in to show Moshe again. But as I was about to push my pin into the hem, an idea flashed into my head, and I turned it up to make a whole 9 inch hem! Moshe did a sudden turn around, saying he loved it now. Great. 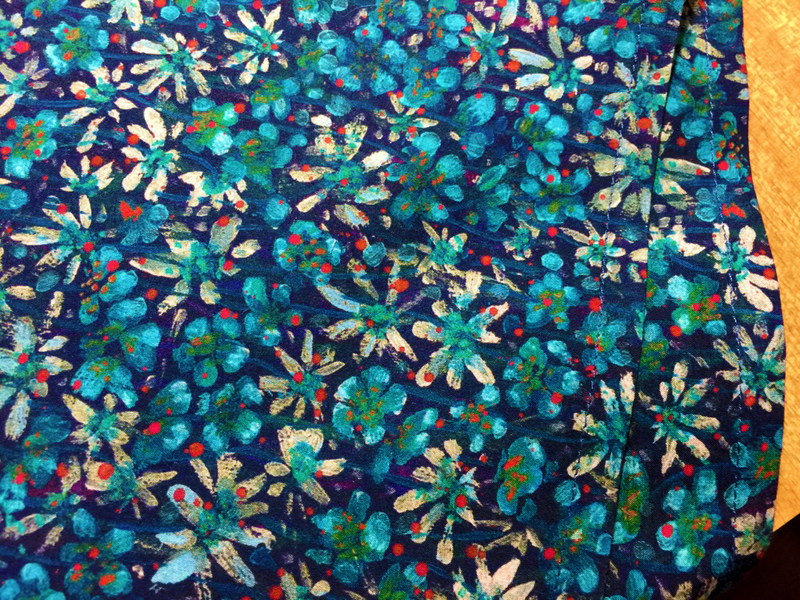 You can’t even see the sewing line, can you, but it gives the dress a lovely weight, albeit a soft one in this Liberty! It was 6 o’clock, and I had to be ready to leave at 7:15. I still had to shower and wash my hair. So, inspired by Anna’s deep hems, I just pinned and topstitched it in place. Now it was looking good! I just had the neckline to do. I measured it around fairly roughly, added 6 inches to the calculation for the join, and cut a 1½ inch bias strip. 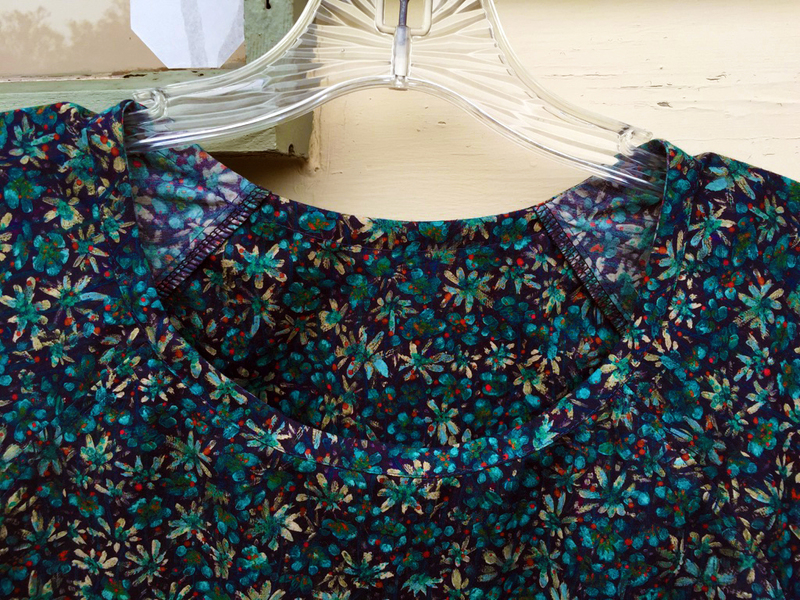 I folded it in half, pinned it to the wrong side of the neckline, and after joining the ends of the bias using this easy method, I stitched a ¼ inch seam, pressed and turned the facing to the front, and topstitched close to the edge. And that was it! Done. It’s such a quick make, I was ready right on time with hair, makeup, everything done. I felt so good in my new dress. 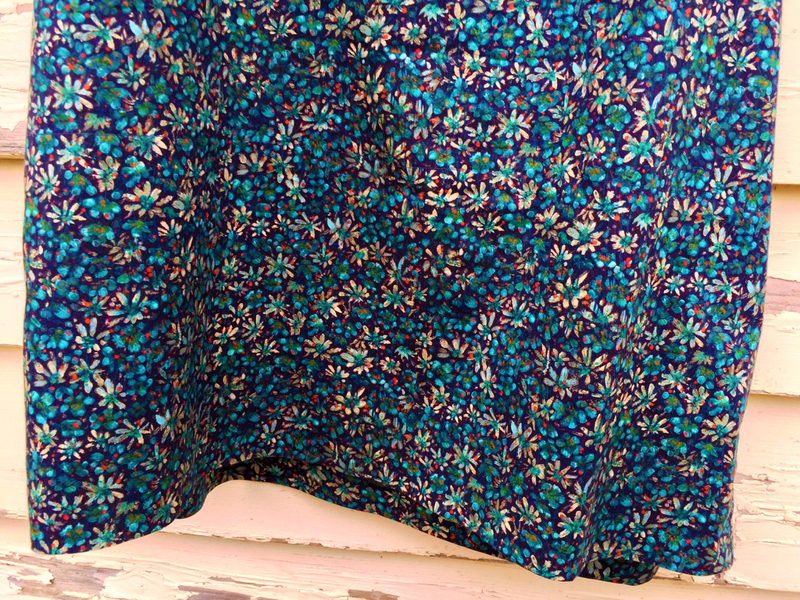 The only thing that bothered me a little was that the deep hem got a little messed up at the back where I was sitting on my bar stool, so today I ironed the dress hem flat again, and topstitched a ¼ inch away from the edge all the way around. I usually don’t like a stitched hem, but I didn’t think it would be bad on this dress, as you can hardly see it against the fabric, and now it should stay nice and neat, which was more important. The only other thing I think I’d have done had I thought about it earlier is cut the sleeves about 5cm longer so that the seams could be a little deeper, avoiding the wrong side showing though as much as it does. No biggie though. I still love it to bits! L to R: Anna Maria Horner linen, Nani Iro double gauze, and a lovely ponte once I’ve practised the whole knit/overlocker thing! Alterations: Used 1½ inch bias strip for neck binding; ½ inch seams, overlocked and topstitched; deep 9-inch hem.